Seward finally met their match Saturday evening at the Chap Center in Midland. Number 20 Midland topped Seward 77-67 handing the eighth ranked gals in green their first loss. 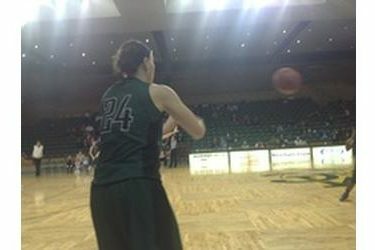 Seward shot 36 percent and went 9-34 from three point range. The Lady Saint leading sophomores Daniela Galindo and Axelle Bernard were a combined 4-22 from the field. Midland had a slight rebounding advantage 45-40. Fouls were also an issue as the home standing Lady Chaps were 17-24 from the field and SCCC was 6-9. Joanna Grymek fouled out but scored 14 on 5-5 shooting. Tiani White scored 14 and Samm Ashida had 10. Seward is 5-1 and hosts the Billy’s/Days Inn Classic Friday against Fort Carson and Saturday against Frank Phillips at 6 both nights on 1270 and kscbnews.net. Midland is 7-1.